Wed 24th Feb, Central Library 6.00pm Tickets now available here. From a mischievous raccoon, to Trick or Treat gone mad, enjoy these shorts specially selected for the Kinofilm Festival. Be amused, entertained, touched and informed by films that have made their way around the world, including the Oscar nominated ‘A Single Life’. 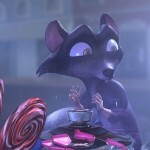 Baxter the raccoon gets into Granny’s Sweet Shop, but his candy obsession winds up getting the best of him. 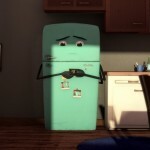 A charming story about a misunderstanding between a man named Stanley and his treasured 1950s fridge named Chillie. The four lovable and sweet main characters capture our hearts as they gradually have to confront an unexpected challenge to their very existence. 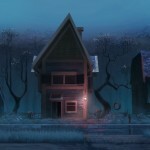 A father decides his son is old enough to leave home-only each time he does, he returns in increasingly strange ways. 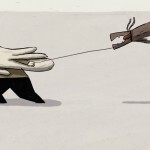 The To-Do list comes alive in this award-winning, collaborative animation. 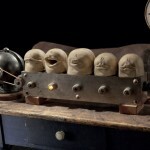 A vowel reciting machine describes in a soliloquy its miserable existence at the hands of a despotic singing teacher. A young man lives inside a billboard, updating the advertisements. When he falls in love with a beautiful lady living across the highway, he uses the only method he knows to get his message across: Advertising. Once upon a time there was a paper boat, who lived in an abandoned toy store. This is the story of his life’s journey. 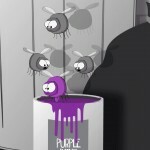 When a bug accidentally turns purple, he is taught a valuable lesson in friendship. 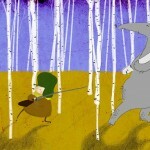 In order to become a real man, little Ivan must pass a test of courage in which he has to kill a wolf. But it is not easy at all, since the two of them like each other right away. The Story of a house which escapes from its suburban foundations and sets off on an epic journey. 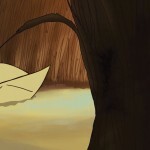 An animated short about the daily routine of life in a windy country. The inhabitants have learned to deal with their difficult living conditions, with the wind creating a natural system for day-to-day routine. An estranged gay couple is visited by a mischievous cupid just in time for Christmas. Based on a comic by Ralf Konig. It is Halloween and three kids go out trick or treating. It’s a windy night and the only welcoming person in the small town is treated to an unexpected sight.